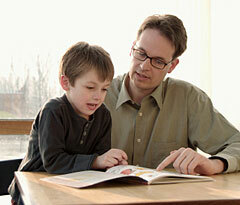 There are many places on the internet to find parenting advice and information. These are a few we think are particularly good. Ages and Stages Questionnaire – A parent-completed questionnaire to check your child’s physical, social and emotional development for Birth to 5-years. Autism Society – Improving the lives of all affected by autism. Autism Speaks – Family services, research, and advocacy. Born Learning – Explore ways to turn everyday moments into fun learning opportunities with your young child. Building Family Assets – Ideas for building on the strengths of your family, from the Search Institute. Centers for Disease Control and Prevention (CDC) – Checklists and informational brochures on developmental milestones, ages 0 – 6 years. English & Spanish. Center for Effective Parenting – Handouts for parents on topics in three main age ranges: Early Childhood, School-age Childhood, and Parental Involvement in Education (hand outs are available in English & Spanish). Center on the Social and Emotional Foundations for Early Learning (CSEFEL) – Practical information on how to teach positive social and emotional skills in young children. Cerebral Palsy Treatment Guide – a national organization that helps families and individuals affected by cerebral palsy. Changing Brains – Information for parents, educators, and policymakers about the effects of experience on human brain development. From the University of Oregon’s Brain Development Lab. Child and Family Web Guide – A comprehensive collection of expert reviewed sites on children and families. Online searches for many parent topics yield information that is inconsistent with child development research. The Web Guide selects sites that have the highest quality child development research and that are parent friendly. Tufts University – Eliot Pearson Department of Child Development. Circle of Parents – A network of parent-led self-help groups. Connect Safely (Smart Socializing Starts Here) – Multiple resources on safe use of fixed and mobile social media. Corvallis-Benton County Library’s Birth to 6 blog spot – Early Literacy Newsletter, storytime & event announcements, blog, early literacy activity information, BookFlix. Corvallis-Benton County Library’s Parenting Collection Guide – Find new parenting books, reading suggestions, downloadable parenting books and audiobooks, and online parenting resources. Essentials for Parenting Toddlers and Preschoolers – A Center for Disease Control and Prevention website for parents of young children. Family Talk About Drinking – A parent resource guide for prevention of underage drinking, with written materials & videos for age groups: 1-11, 12-17, 18-21. Growing Child, Inc. – Subscribe to age-based newsletters. IMPACT on Health and Wellness – Offers information and tips that parents can use to fit into their own lives, and shares information that is valuable to the wider world of family health and wellness. Just in Time Parenting – Resources from OSU Extension Articles, age-based newsletters (English & Spanish), webinars, podcasts, “Ask an expert” feature. La Leche League of Oregon – Breastfeeding education, information, support, and encouragement. Online help, local group meetings. (English & Spanish). Linn Together – Parenting Tips to prevent alcohol and other drug abuse. Mind in the Making – A list of children’s books and suggestions about how to use each one to teach the “Seven Essential Life Skills” described in the Mind in the Making book by Ellen Galinsky. English & Spanish tip sheets. Mom Enough® – Parent Forum. National Responsible Fatherhood Clearinghouse – Tips for Dads – great videos. One Tough Job – parent resources from the Children’s Trust Fund of Massachusetts (English and Spanish). Parenting Educator and Social Worker, Gary Direnfeld – Many articles about a wide variety of parenting issues, including handling parenting during separation or divorce. Parent Further – a Search Institute resource for families. Parenthetical – A blog, a website and a social network, all in one place, where you can talk with other parents and interact with experienced parenting educators and adolescent development experts from University of Wisconsin-Madison and University of Wisconsin Cooperative Extension. Parenting Press – A publisher of books on parenting, maintains a page of Weekly Parenting Tips excerpted from their publications. Raising Teens Project – Distills 300 research studies into Ten Tasks of Adolescent Development and Five Basics of Parenting Adolescents, including key messages and strategies for parents. School Readiness Interactive Birth to 3 – an interactive learning tool designed to help parents and caregivers encourage their young children’s early learning. Text4baby – Free messages each week on your cell phone to help you through your pregnancy and your baby’s first year. Univ. of Tennessee Center for Parenting Tip Sheets – Need a tip sheet on a particular parenting topic? Search with keywords or browse through their library of tip sheets for parents. Univ. of Washington – Active Bodies, Active Minds – Screen Time Reduction Information and Resources. Vroom – A phone or computer app or written materials with ideas to boost early learning; use everyday moments to nurture your child’s growing mind. Every parent has what it takes to be a brain builder. Washington Parenting Education Network Blog – Thoughtful commentary on many parenting topics. Links to blogs of several parenting educators in Washington state. Young Adult Development Project – Research and parenting resources on development between the years of 18 to 25, distilled by the MIT Center for Work, Family and Personal Life. Zero to Three – National Center for Infants, Toddlers and Families. Find free parent brochures & guides, including handouts in English & Spanish. Kindergarten Readiness brochure – See what you can do to help prepare your children for Kindergarten.